Dhaka, Jan 29 (Just News): BNP secretary general Mirza Fakhrul Islam Alamgir on Monday threatened to create a 'tsunami of people' to ensure the fall of the government if their chairperson Begum Khaleda Zia is 'unlawfully' convicted in a graft case on February 8. 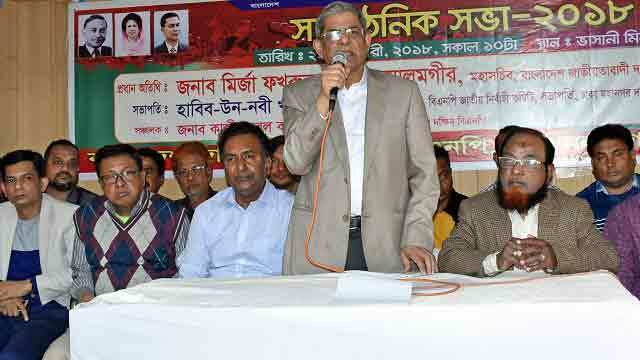 Speaking at a meeting of Dhaka south city unit BNP, he also said the government will not be able to defeat Khaleda Zia by hatching any conspiracy against her. "Our target is to create a tsunami of people. Now we'll have to work to generate a strong wave of people...the strong wave like tsunami can be created through uniting people, and no one will be able to resist it by any means," Fakhrul told his party colleagues. Dhaka south city unit BNP arranged its organisational meeting at Nayapaltan's Moulana Bhasani Auditorium ahead of the court verdict in the Zia Orphanage Trust graft case filed against Khaleda and others. Fakhrul said the government is trying to keep their chairperson away from politics by 'unlawfully' convicting her in a 'false' case only to clear their obstacle to staying in power. "The 1/11 regime arrested Khaleda Zia and kept her in jail for nearly one year. But they're finally forced to release her. Awami repeatedly tried to destroy BNP, but they couldn't do it. BNP will remain as a stronger party under the leadership of Khaleda Zia," he observed. The BNP leader said people are with their party and their chairperson as they are working for protecting the country and democracy. Speaking at the programme, Dhaka south city BNP president Habib-un-Nabi Khan Sohel urged BNP leaders and activists to get ready for foiling any type of plot against their chairperson by showing their strength on the streets.